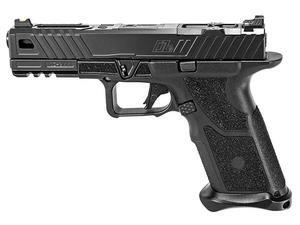 The New OZ9 is a 9mm pistol built from the ground up at ZEV. The OZ9 utilizes a serialized steel receiver running the entire length of the pistol. Extended rails include channels to clear out debris and also act as lubrication reservoirs. A flat faced trigger is housed in the steel receiver, allowing for grip upgrades without completely taking down the pistol. The 18 degree grip angle offers a more natural pointing experience. The improved grip offers steeper angles and forward hand position for better muzzle control. The OZ9 slide feature extensive machine work by ZEV and is factory milled to accept a Trijicon RMR optic(Not Included).